Hooray! Hotel Transylvania 2 is finally in theaters! It seems like we have been waiting a looooong time for this one, so we’re excited it’s finally here. All of our favorite characters are back with a brand new story. The hotel is now welcoming human guests (a reverse of the previous monster-only policy), but Dracula is worried that Dennis, his half-human/half-vampire grandson, isn’t showing signs of being a vampire. So – he decides to put him through his own monster-style boot camp. 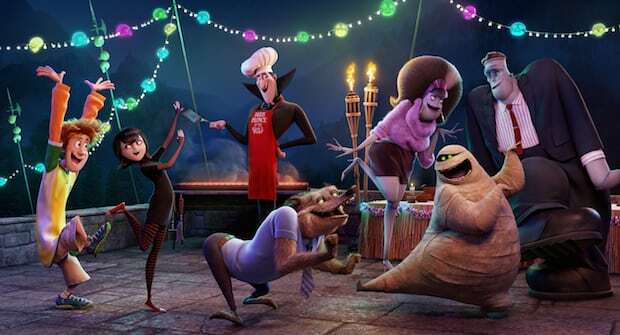 I love that Hotel Transylvania 2 is chock-full of familiar voices including Adam Sandler, Andy Samberg, Selena Gomez, Kevin James, Fran Drescher, Steve Buscemi, Molly Shannon, David Spade and more. One of these super fun characters is CeeLo Green as Murray the Mummy. 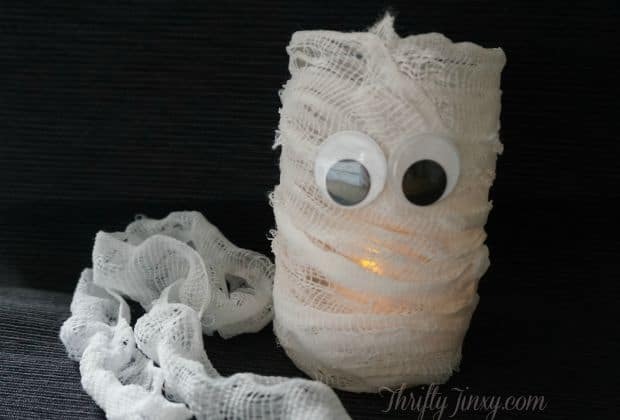 In his honor, we have a fun Mummy Jar Candle DIY project that’s perfect for decorating your house throughout the Halloween season. It’s easy to make and your kids can make it themselves with a bit of guidance from you. Unroll the gauze and cut into strips about 20″ long. Pull and stretch the gauze to give it a distressed look. 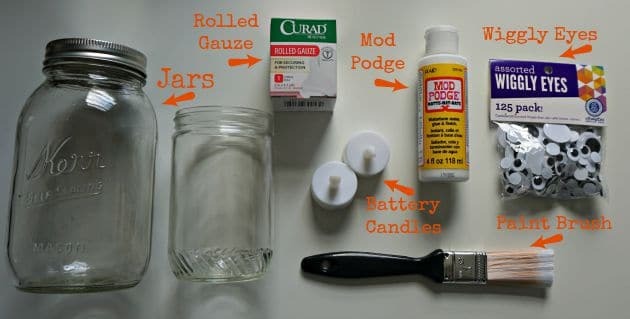 Using the paint brush, coat the jar with a layer of Mod Podge. Easy, right? 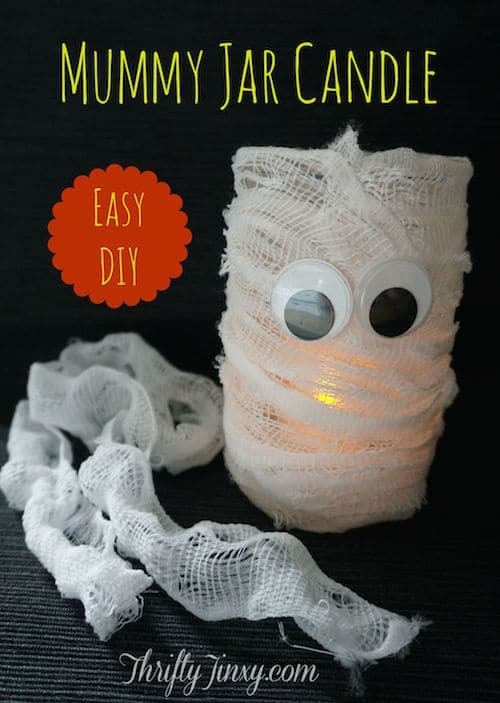 You can use any types of jars to make different sizes and shapes of mummies. 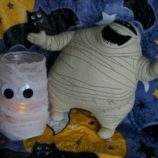 The mummy above was made with an empty peanut butter jar, which gave it a nice, stocky shape – very similar to Murray the Mummy from the movie! 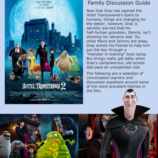 You can find lots more Hotel Transylvania 2 fun from Fandango Family. There are lots of photos, a character guide, a quiz and more. Want even MORE mummy-inspired fun? 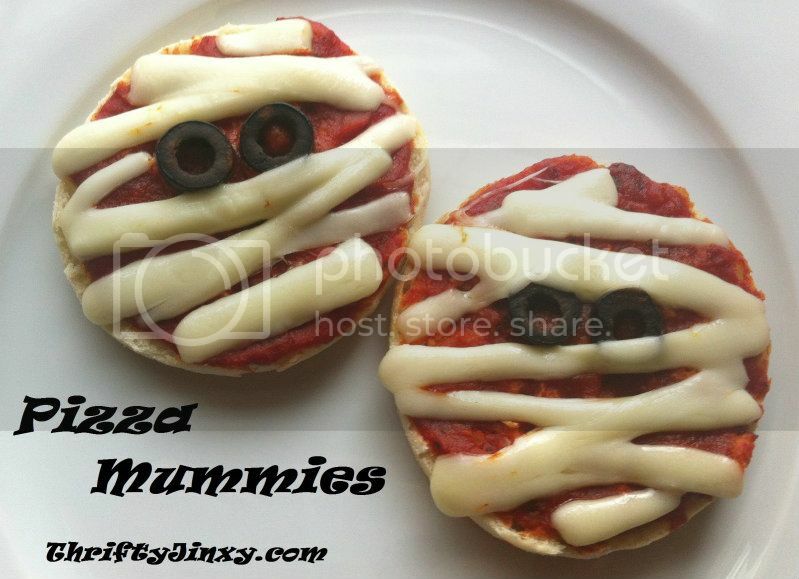 Check out our easy recipe for Pizza Mummies! 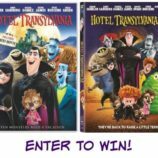 Reader Giveaway: Two lucky Thrifty Jinxy readers will each win a$100 Fandango gift card so that they can treat their family to see Hotel Transylvania 2 – or any other movie – in participating theaters. To enter, just complete the entry form below by 11:59pm ET on 10/21/15. Good luck! I’m excited to see Hotel Transylvania 2 because we enjoyed the original. My kids are so excited to see this movie, which makes me happy! And I enjoyed the first movie and want to see what happens in this one! I’m excited to see the hunger games! 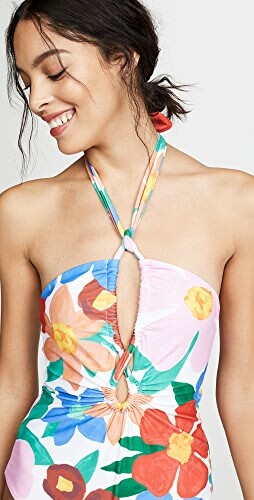 I loved the first one and am super excited about this one as well! I’m excited to see Hotel Transylvania 2 because my kids would really love this movie and it will gets us in the mood for Halloween. Thanks so much. I am excited to see transylvania 2 because we like to see funny movies. Though it hasn’t gotten great reviews, I’d still love to see the Stonewall movie. The voice cast for this one looks super funny. THE IRON GIANT: SIGNATURE EDITION is what I am really excited to see! I loved this movie…. I am excited for star wars! I want to see Black Mass. I’m excited because we loved the first one so much!! I am excited to see the movie theater broadcast of National Theatre’s Hamlet with Benedict Cumberbatch. Thanks for the chance to win this awesome giveaway! I would like to see Maze Runner the Scorch Trials. The kids loved the first movie so they are excited to see the 2nd one. I hear it is good. I cannot wait to see Sicario. I love cartoon movies and my son’s finally old enough to sit through a movie. Looking forward to seeing. My kids are excited to see it because they enjoyed the original Hotel Transylvania. I am excited to see Maze Runner!!! My family would really like to see Transylvania 2 because we all really enjoyed the first one. I want to go with my friends to see The Intern. I enjoyed the first movie, and would like to see the second. I am excited to see Hotel Transylvania 2 because my family really enjoyed the first one and are looking forward to the second one. Thanks for the giveaway, I hope that I win. I’m excited because the first one was so cute and funny, the second one sounds like it won’t disappoint! The Good Dinosaur looks cute & my boys can’t wait to see it! We loved the first movie! I’m also excited to see Pan since I’m a huge Peter Pan fan! I took my daughter to see the first movie and we both loved it so we are looking forward to enjoying the 2nd one! I am excited to see Hotel Transylvania 2 because the characters look cute. I would like to take my step daughter to see this – we really enjoyed the first movie – a perfect Halloween treat! Thanks! I am really looking forward to seeing the new James Bond movie when it comes out. I look forward to it because it is a movie my son and I can enjoy together. I am excited to see black mass. I want to see the Scorch Trials in that new type of surround theater experience. Tell us why you’re excited to see Hotel Transylvania 2! Or visit Fandango.com and/or tell us what other upcoming movie you are excited to see. I want to see The Visit. I’m excited to see this because I enjoyed the first one a lot. I am more excited for the Hunger Games to come out than anything else. I really hope it is good. We absolutely want to go see Hotel Translyvania 2, but another movie we want to go see is The Martian! I love taking my daughters to see family friendly movies. Hotel Transylvania is a favorite in our home so we must see the sequel. We are so excited for this movie! My whole family love Hotel Transylvania. I want to see The Martian. I love taking my daughter to cute movies that she will enjoy. I’m excited to see this because it looks adorable. I’m excited to see Crimson Peak next month. I think we will love Hotel Transylvania 2! Looks like a lot of fun! I’m excited to see it because it looks like a great movie and my family would love to see it. I am excited to see Hotel Transylvania 2, Pan and Gem! We are looking forward to seeing this one and the Good Dinosaur. I loved the first Hotel Transylvania movie. Looking forward to seeing Hotel Transylvania and getting into the Halloween mood. I would love to see Jurassic Park. I want to see it with the kids because it will be a fun movie to see. I LOVED the first Hotel Transylvania, so I have to see Transylvania 2! I’d like to see Maze Runner: The Scorch Trials. I thoroughly enjoyed the first one, so I’m hoping the 2nd one is just as great if not better! The first Hotel Transylvania was so entertaining, I can’t wait to see the second one! Our whole family enjoyed it, everyone is excited to see the new one! The first Hotel Transylvania was so cute and a very good movie. I’m sure the second one will be just as good, so I would love to be able to go and see it when it comes out! I’m looking forward to seeing The Martian and Mockingjay Part 2. I’m excited to see Hotel Transylvania 2 because my kids are dying to see it. I always love when they both want to see the same movie! We are going to see The Martian and Mockingjay Part 2. We expect both to be very good movies. We saw Hotel Transylvania on opening weekend, we had a blast! I can’t wait for Star Wars and Deadpool! Can’t wait to see this with my grandkids & also can’t wait for Good Dinosaur!! Ty for the chance! I really enjoyed the first movie! And now that my kids are older, I think they will like it, too! My kiddo is excited to see it because the first was a cute movie. I loved the first one and so did my girls. It was a real cute movie. I bet the second one is just as good. Cool, I’d love to see more DIY arts and crafts on here. My son and I love going to the movies together. I think he’d really enjoy Transylvania 2. The next movie we are planning to see is The Martian – it opens this weekend. I like the cast of the movie plus we liked the first one. I’m excited to see this because the kids enjoyed the first movie, and Halloween is coming up! I would love to see Everest! Although I’d like to see Hotel Transylvania 2 because the 1st one was so cute, I actually would rather see The Intern! It looks so good, and I love Robert DeNiro! We havent seen the movie and I think it looks fun and also not too scary which is good for younger viewrs. I like rge chanraacters too..
I’m really looking forward to seeing Everest that is out now as well as The Hunger Games : Mocking Jay Part 2 which comes out in November. I’m really looking forward to seeing The Martian! The next movie we play to see is Maze Runner but this one is on the list too…..
My kids and I loved the first and can’t wait to see the second. We love the first oe so we can’t wait to see the second. We really enjoyed the first one and Halloween themed movies are some of our favorites! I want to see the 2nd Maze Runner so badly! My daughter and I absolutely loved the first one and can not wait to see the second movie! My kids and I loved the first one so we can’t wait to see the sequel! The first one was wonderful! I am hoping that this one is just as good! I loved the movie, it was so cute! This is the first movie my 4 year old grand daughter made it the whole way through at a theatre!! YEAH!! I am excited about going to the movie because it looks good. i also enjoy and like the idea of the whole family going together. thanks for the chance. First movie was cute. I’m sure my niece would love to see part 2. I loved the first movie so I’m excited to see the second! I really liked the first one so I can’t wait to sed this one! I’d really like to see the Martian and the Intern! Going to see Transylvania 2 is what my grandson wants to do for his birthday. The first was just too good! I enjoyed the first movie and would like to see the second one too. My niece loved the first one so she will be thrilled to have me take her to the new one! I want to see The Intern. I would like to see if this is as good or better than the original. This would be the perfect Halloween movie! Perfect for my grandsons. What a cute movie and even cuter craft!! I want to see Hotel Transylvania 2 movie because I love the first one. I am always looking for good Halloween movies and this looks like it will be good. We loved the first one so we cannot wait to see Hotel Transylvania 2! We love Halloween movies! I am most excited to see the Martian. I am excited to see the movie because my grandchildren would love to see it with me. We’re excited to see this movie because the first one was so good. My kids loved the story and the characters so much. My grandson and I will love this movie! Sounds great! I am excited to see the Peanuts movie. I like the werewolf guy! I have been it advertised on tv and it looks so cute and I am anxious for my family to see the movie. cuz i loved the 1st one n so did my kids! My kids are excited to see the Goosebumps movie on Halloween. I’m excited to see it b/c I know the whole family will love it! We loved the first movie so my boys and I are excited to see this one. I think Hotel Transylvania 2 looks like a great family movie to go see. We love Adam Sandler too. I would love to see The Martian with Matt Damon. I’m really excited to see The Intern. Thanks. we want to see transylvania 2 and jurassic park…. Looks like a cute movie! I really want to see The Martian too. I saw the trailer and I thought it was something that my nephew and I would enjoy watching together. First one was so good! We are excited to see it to see if it lives up to the hype. We liked the first one alot. ‘m also excited to see Pan. I’m also excited to see Pan. We want to see it, because we loved the first one! I can’t wait to take my kids to see the new Hotel Transylvania 2 movie! They loved the first one, and it is a great way to spend quality time together during Halloween time! I loved the first movie so I am excited about this one. Mavis was my favorite character in the first movie, so I am glad her story is continuing, and Dennis looks so cute! I’m excited to see the movie Sisters. I took my niece to see the first one, so we are palinning to see this one together also. We loved the first one and I know my sons want to see the second one. The first one was so cute and fun so we are excited to see it continue. I’m so excited to see the new Star Wars film. We loved the first movie, so I can’t wait to take the kids to see the 2nd one! I think it’s going to be awesome! I have very much enjoy the first one. And I think the 2nd one would be awesome as well. 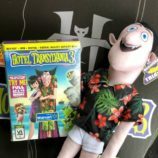 My daughter and I loved the first Hotel Translyvania and we know from the trailers this was is going to be just as funny! I am excited to see it because children’s movies are really funny! We haven’t seen it yet but the boys loved the first one. The upcoming movie I really want to see is the new “Star Wars” film. My grandkids are so excited to see Transylvania 2!! I loved the first one, can’t wait to see what happens in this one! i am excited to see it because i loved the first one. I would love to take my three boys to see it because the first one was so awesome! I am super excited to see Hotel Transylvania 2 because it looks like a fun family movie to share with my kids. I am very excited about seeing Hotel Transylvania 2 because I really enjoyed the first version. My 8 yr old loved the first movie, and wants to see this one as well. I’m excited about Hotel Transylvania 2 because the first one was so good! I’m sure this will be just as good or even better! I love that! So cute. Wiggly eyes get me every time. Thank you for the giveaway. It looks like a funny, family film! I’d love to see it with my kids. i love adam sandler and i have seen all his movies! this is somehting i can share with the kids! I want to see it with my kidos. The first one was great! My kids have been pestering me to see Hotel Transylvania 2, so I know they are excited. I’m looking forward to the new Hunger Games movie. We went to the drive in to see it a couple of weeks ago. We all loved it! I am excited to see this movie because my family really enjoyed the first one. My kids can’t wait to see this movie when it comes to are area. We’re looking forward to seeing the second movie because we loved the first movie. I’m looking forward to STAR WARS!!! Can’t wait to take my nieces! I can’t wait until the The hunger games. I am excited about the new Hunger Games movie coming out. I already saw it with my boys, but now we’re excited to see Star Wars! Cover a candle in flammables… maybe just rethink this one. In my work, I see a lot of people after house fires, so this seems obvious to me. I am looking forward to seeing it because it is perfect for the season! My kids have been talking about it, would love to take them to see it. My niece loved the first one. She’s excited to watch the sequel. We really enjoyed the first Hotel Transylvania movie and have watched the DVD many times at our house. We are hoping the sequel will be just as much fun. Thank you for the great giveaway! Hotel Transylvania is our favorite and first for the season. We loved it! because we really liked the 1st one! I can’t wait to see Mockingjay Part II when it comes out next month! This looks like a great movie.I can’t wait for my children to see this ! I am looking forward to seeing this movie because I love holiday movies! I am excited to see Star Wars!! My kids loved the first one and cant wait for the next one to come out. I would love to see the sequel because I enjoyed the first. I am excited to see it because we loved the first Hotel Transylvania, my grandkids can’t wait to see it. Looking forward to see the new movie. I am excited to see it because I am a little kid at heart! I cant wait to see the new star wars movie, i have been of fan since i was a kid..
Can wait to go see it with my niece and nephew. They loved the first one! I’m excited to see The Peanuts Movie. I am excited to see the sequel because I saw the first part and loved it! My family and I love going to the movies. I think No Escape would be the first on my list! I am really excited to see Star Wars: The Force Awakens. I want to see the new maze runner movie. The movie looks so fun! My kids loved the first one and I can’t wait for them to see the second! We enjoyed the first one, so would like to see the new ones. I’d like to see Goosebumps. I can’t wait for the upcoming Star Wars movie!! My family would like to see Transylvania 2 because we all really enjoyed the first one. I already saw it! I love the animation! I want to see the Goosebumps movie! The girls and I have been wanting to see this movie, and my grandson wants to see Goosebumps. We can’t wait to watch The Good Dino and the last Mockingjay movie. Thank you!! An upcoming movie that I am excited to see is Spectre. Thanks for the fantastic opportunity to win! So excited to see Hotel Transylvania 2 because my kids really love Halloween and loved the first movie! I can’t wait to see Star Wars the Force Awakens! My inner nerd is giddy with anticipation! I can’t wait to see Spectre. I am anxiously awaiting the the Star Wars movie. Our family has been avid fans of the series since we saw the very first one. I love the first movie really a lot so i think i would love to sedcond one. im looking forward to it because I watched the first one and loved it! I am looking forward to this film because it is one both my kids and I enjoy! I am soooo very excited to see the new Star wars movie in December! I want to see it because my grandchildren & I would really enjoy it! I am excited to see it because we enjoyed the first one. 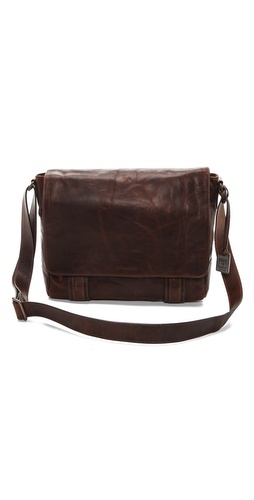 Thank You for the giveaway…we await the release of the new Star Wars movie ! I am most excited to see this movie as I saw the first one and loved it. We’d really like to see Hotel Transylvania 2 because we enjoyed the first one. It’s a perfect idea for this time of year: a funny scary movie that appeals across age ranges. 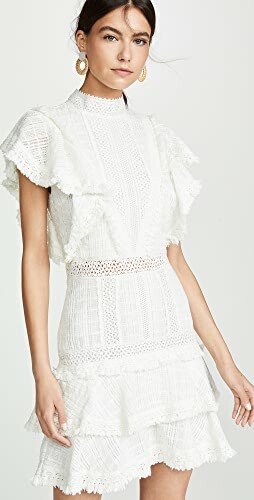 Shop Lace Up Dresses, High Rise Skinny Jeans, Flat Silver Shoes, Bralettes and more. Get this widget.